LOS ANGELES, Jan. 15, 2019 /PRNewswire/ -- UniFirst Corporation (NYSE: UNF), a North American leader in providing customized work uniform programs, corporate attire, and facility service products, is hosting a ribbon-cutting ceremony on Wednesday, January 30, 2019, at 11:00 a.m. to celebrate the opening of its new 73,000-square-foot, state-of-the-art industrial laundry plant at 13123 Rosecrans Ave. in Santa Fe Springs, Calif. The new facility has created more than 100 jobs to service businesses in the Greater Los Angeles area. The new plant, which features the latest innovations in textile services technology and automation, was developed to accommodate the rapidly growing customer base in Greater Los Angeles, Long Beach, Newport Beach, Anaheim, and surrounding areas. It provides local businesses with managed service programs for uniforms and workwear, as well as facility service products, including floor mats and mops, wipers and towels, and restroom and ancillary products. 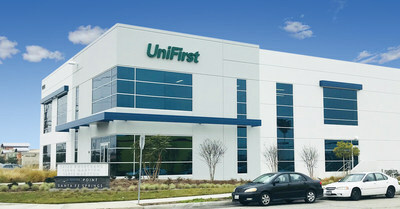 UniFirst had previously serviced area customers from its smaller-sized branch facility in Norwalk, Calif., which employed 55 people, most of whom relocated to the new facility. "Our LA plant is an engineering showpiece," says UniFirst president and CEO, Steven Sintros. "The new facility features latest technologies and high-tech processing systems that are among the most advanced in the textile service industry. This will allow us to continually improve our managed uniform programs for our customers' benefit, so they consistently receive the very best services possible." Spanning 3.57 acres, the new plant also has an eye on the "greener" side. The new UniFirst facility supports greater energy efficiency through investments that include heat reclaiming equipment, latest-generation warehouse lighting, and contemporary rooftop HVAC units. All cleaning formulas and detergents are 100% environmentally friendly and natural light throughout the plant offers a positive employee boost to the workday. "We're extremely excited to bring this world-class operation to the Greater Los Angeles market," said the new plant's general manager, Anthony Ortega. "Our L.A. operation is the culmination of all the technological advancements we've made over the years, serving as a model for new UniFirst servicing operations to come, and reinforces our ongoing commitment to quality, efficiency, and industry-leading customer service. It also represents UniFirst's long-term commitment to the local business community, the surrounding regions, and the state of California."